The first thing you notice when you open the box is that the Epson Workforce 600 is a nice looking machine. The sleek looking printer will fit in with the decor of most offices or it might even improve the decor of your office space. 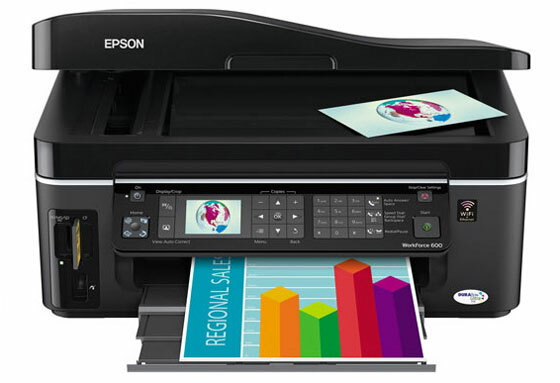 The Epson Workforce 600 is a feature rich printer at a very affordable price ($199). It can Print / Copy / Scan / Photo / Fax plus it has WiFi . Consumers will find that the user interface on the Epson Workforce 600 is very user friendly thanks to the 2.5? color LCD screen that tilts for easy viewing. The printer is a pure speed demon without compromising any quality. Epson is trying to entice small business consumers that are looking into laser printers for the office and they will succeed based on speed, price and laser quality . Epson claims the Workforce 600 is twice as fast as their competition and I believe it. The print outs are not as fast as laser but pretty damn close. It can print out 27 ppm of text or 19 ppm of color. It has built-in memory card slots for PC-free printing. You can even crop directly from the printer itself. Epson uses DuraBrite ink that is smudge, fade, water and highlighter resistant. The 4 printers cartridges are all individual and you have the option of using a standard ($12.35 for color, $17 for black) or high capacity ($17 for color, $20 for black ) for any of the colors and a extra high capacity cartridge for the black ($28.50). The paper is loaded from the back and no issues with any printer jams. Another plus for this printer, it uses up to 3x less power than a laser printer. Sending and receiving faxes is super easy thanks to the 2.5? LCD screen. It can store 60 fax numbers on speed dial and it can receive up to 180 pages in memory. You can copy in black and white or color and everything is straightforward due to the great user interface and the bright display. Just load the automatic document feeder, enter your settings, hit start and before you even turn around the copies are done. Now with built in Wifi, it makes setting up the printer to work on your network wirelessly child’s play. Just follow the setup instructions on screen from the included setup disk and your wireless printer network will be up in running in minutes. You can also connect via Ethernet cable or USB. The Epson Workforce 600 is a perfect addition to any small or mid-sized office. During this economic downturn where every dollar counts, you will be hard pressed to find a better printer for $200 that does everything this sleek looking printer can do. This entry was posted on Tuesday, December 9th, 2008 at 10:36 am	and is filed under Epson, multifunction, review. "Ricoh Launches the Aficio MP C2050/MP C2550 Color Multifunctions"
"Epson Enhances Its A3 Printers Line"